Here is the problem: how do you let your dog roam safely in your yard, off his leash, any time he wants? Here is the solution: a wireless dog fence. Wireless fences have been around since the early 1970s, but the last decade has seen an incredible increase in both demand and product options. Why has this become the must-have item for dog lovers, and what is behind its phenomenal popularity? While all dogs love adventure and the opportunity to run free, the instinct to protect their “pack,” i.e. your family, is much stronger. Knowing their perimeter gives them a sense of both purpose and duty, and this makes them happy dogs. Fun fact, these fences also work with cats! 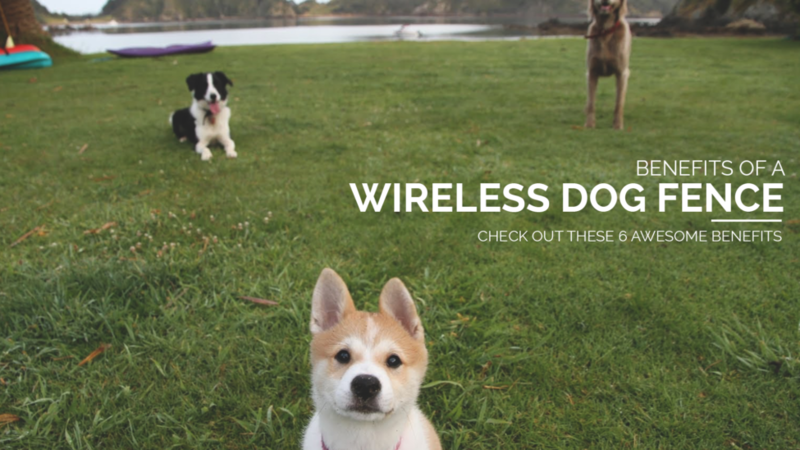 1) WHAT is a wireless dog fence? 2) WHY is it effective? 3) WHEN is it ineffective? 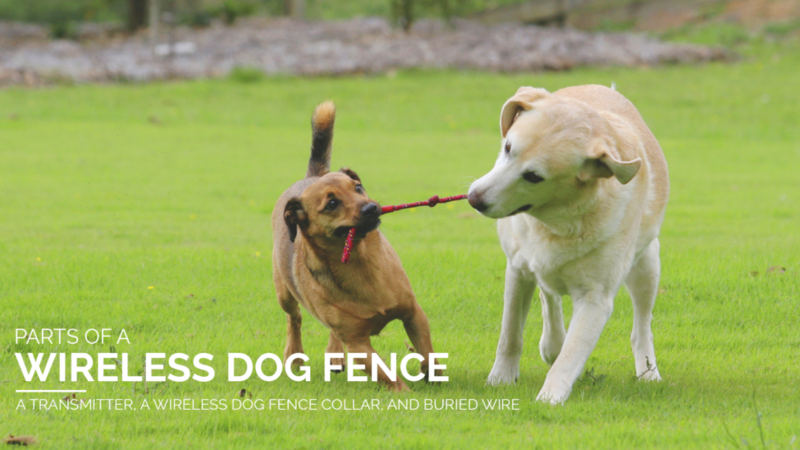 Wireless dog containment typically features three parts: a transmitter, a wireless dog fence collar, and a ground wire that you bury in the desired boundary line. More recent models of wireless pet fences now have no wire to bury, rather, they use radio transmission or Wi-Fi, and heat and motion detection to keep dogs safe in your yard. However, the in-ground wire can be expanded more easily than the radio or Wi-Fi system, and offer more room to move. Systems with a buried wire feature are ideal when you need to protect certain areas of your yard, such as a pool, children’s area or landscaping. Number One: As stated before, wireless fence systems are practically impossible for your dog to escape from. With no structure to scale or climb (or worse, impale or scratch yourself on,) this offers some relief. While a curious dog may dig up the ground wire, wireless fence systems are equipped with warning signals to immediately alert your system of any kind of breach. The extra layer of vigilance is one advantage of the best wireless dog fence over a traditional fence. Number Two: Wireless fence systems’ transmitters and collar receivers are exceptionally durable. Transmitters can be mounted in environments with extreme temperature changes (garage or basement,) and are water- and lightning-proof. Number Three: Wireless fences can be easy to install, and many companies offer at-home training of your dog in those first few crucial days that the system is in place and learning new boundaries begins. Depending on the complexity and range of your system, a wireless fence could be up and running within a day or two. Number Four: Multiple dogs can be included in the system, with people sometimes including their neighbor’s dogs in the wireless fence boundary. Some systems even allow your yard to link up with a neighboring yard, to expand the boundary of your barrier even further. Number Five: Most size dogs and most dog temperaments are candidates for this amazing technology. A few exceptions are discussed in a bit. Number Six: Wireless fences are often a more affordable option versus a traditional fence. As the technology gets better and less costly, the manufacturers pass on the savings to you. 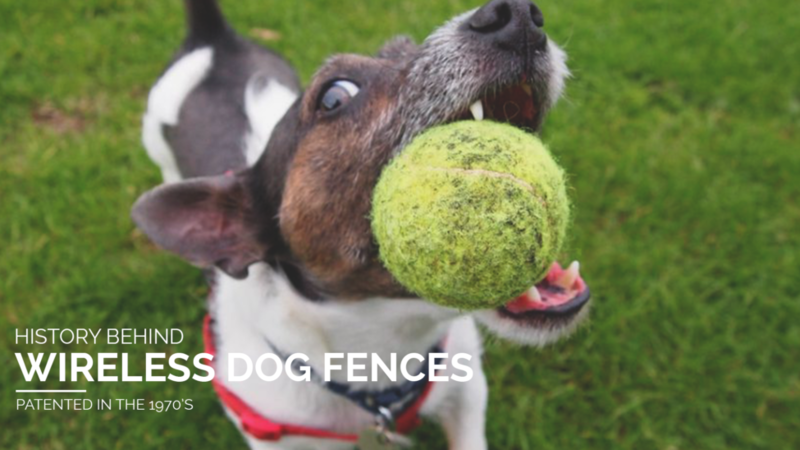 Plus, the cost of maintaining a wireless fence is dwarfed by the cost of keeping up a typical fence, with the latter needing regular painting, cleaning, and often repairing, especially if your dog loves to dig, scratch and climb. 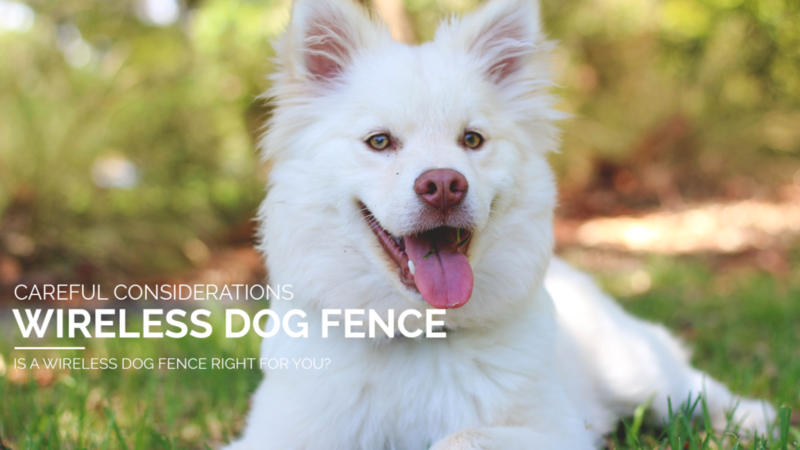 A few factors when considering a wireless fence include the size of dog, temperament, terrain, and makeup of your backyard, and ethical concerns. For example, these systems are best suited to dogs weighing over eight pounds. Even though they are lightweight, the receiver collar may be too heavy. Certain breeds with a high “prey instinct” will find that their need to traverse the boundary will outweigh any kind of deterrent, so ask your vet if your particular dog breed will be safely contained with a wireless fence. A wireless fence will keep YOUR dog IN, but will not keep wildlife, coyotes and stray dogs OUT. Be mindful of the threats in your own neighborhood, and plan accordingly. Also, particularly rocky, hilly or tree-laden backyards are not the best fit for a wireless fence system. Trees and large rocks can block the signals needed to keep your dog out of harm’s way. Lastly, although many vets use and even recommend wireless fences for dogs, there is a remnant of dog owners who refuse to use any kind of deterrent that could be perceived by their dogs as punishment. Even though the correction used in the wireless fence is harmless and not unpleasant, some dog owners will give it a pass. We hope we have informed you about your options when choosing a purchasing a wireless fence for your family pet. Keep our guidelines in mind as you select the best option for your good dog! Check to see if a Pet Stop dealer is near you here.